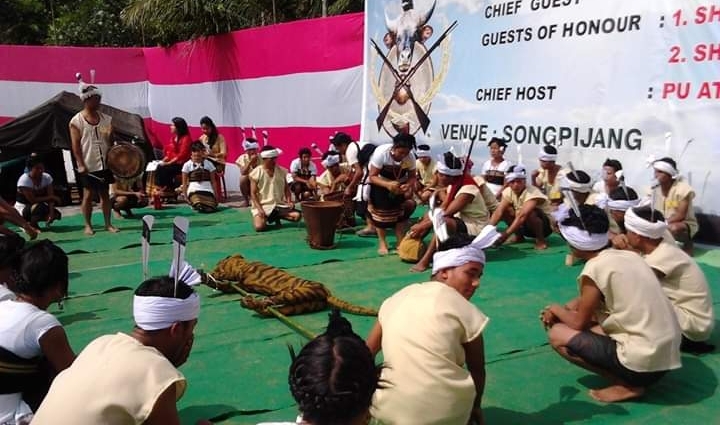 Along with rest of the Kuki inhabited places of the world, the 30th Kuki Chavang Kut was celebrated in every Kuki villages of Dima Hasao district of Assam on Thursday. The celebration at Songpijang, the headquarter of the Kuki community in Assam, was graced as chief guest by the Executive Member of N C Hills Autonomous Council for Education, Tourism, etc Kulendra Daulagupu, while chief host was the assistant gaon burha of the village L M Chongloi. Addressing the huge gathering, Daulagupu recalled the history of good relationship between the Kuki and Dimasa and thanked the present Kuki community for maintaining this good relationship till date. He conveyed the Kut greetings of the CEM Debolal Gorlosa and informed that the CEM had given to take up the demands of the village. Earlier, the chief guest was welcomed by Kuki traditional greetings with ‘Lili ho’ by the mass gathering. It was followed by welcome songs and dances. Invocation prayer was offered by Rev T S Changsan, feliciatation by the chief of the village L Guite. During unfurling of the ‘Kut flag’ by the Chief Guest, the gathering sounded ‘Lili ho’ in unison and dances and songs followed again. The celebrated actually started from the night of October 31, 2018 with cultural programme at night, where local artistes performed various types of traditional as well as modern dances and songs. One soloist Shiv Kumar Thapa of Bhanjung village also presented famous Kuki song ‘Pathen semkhel Lanu’. The first round of a beauty contest also took place and successful students during the year were also felicitated by the organizers Songpijang Youth Club (SYC) and Village Defence Party (VDP). The evening was also filled with a cultural programme.